Home Gaming News Wreck Age 2nd Edition has Landed! Wreck Age 2nd Edition has Landed! A brand new Wreck Age edition, with lots of new ways to explore The Wilds. If you’ve been following our blog, you’ve seen some of the informational roll-outs we’ve been doing for 2nd edition, just trickling out a bit of information at a time, but now it’s time for a deluge. So get your umbrellas and raincoats on, because here comes 2nd edition! 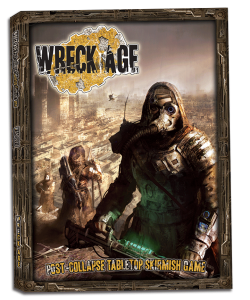 Wreck Age 2nd Edition features some never-before-seen features in a tabletop roleplaying game. We take the Resource Unit system and push it further than ever before in campaign play, and give you Structures! Structures are buildable items that generate things over the course of a cycle (the campaign turn). Each Structure has unique advantage (and sometimes disadvantages) that help you grow your community in the direction you want. Beyond Structures, we’ve added a bunch more traits, weapons and weapon modification, Feats (which are once-per-game tactics usable only by Player Characters and some Elite models) and a ton more. Gameplay has been both streamlined and expanded, with rules for squads, new optional armor variants, and simplified tournament play. If you’re a more visual person, you can check out the flip-through that Tabletop Minion’s own Uncle Atom did. If you get a chance subscribe to his channel, as there’s great new gaming content he’s putting up every week. Thanks again for your support and see you in The Wilds!